When Chris Columbus gets blamed for 'mistakes' on the first two Harry Potter films, it is tempting to suggest that most of the people doing the blaming are actually on referring to Harry Potter And The Chamber Of Secrets, the far far inferior of the director's two offerings. Where the acting in the first was passable, almost marginalised, and certainly well controlled by Columbus, here it goes all over the place. Everyone seems to be trying far too hard all of a sudden, not aided by the occasional cameo from someone who can't speak, let alone act. Watch out for the Slytherin Quidditch captain's single speaking line, possibly the most painful moment of cinema you'll ever witness. At one point, Draco (Tom Felton), turns and speaks to the camera. There are odd directing and storytelling decisions abound too, where in The Philosopher's Stone, everything seemed to have been carefully tried and tested before it appeared on screen. Chief amongst these is Dobby (voiced by Tinker Tailor Solider Spy's Toby Jones, fact fans), an Elf with a curious penchant for self-harm. His voice is annoying, his appearance is rather annoying, his suicidal tendencies are decidedly not in-keeping with the childish fantasy feel of the rest of the film. It's impossible to eliminate him from the narrative but the artistic decisions surrounding him, at this point in the series, are all wrong. The final chases hint that there was a substantial amount of wasted potential but even they suffer from the lack of development of girl-in-distress Ginny (Bonnie Wright), who basically only features as a near-corpse. There's too much repetition from the first film (Quidditch, Diagon Alley, Hagrid's tendency to say, 'I shouldn't have said that') and ultimately very, very, little to make it stand out from the rest of the films. A poor effort from Columbus, who never returned to the series. I never really like this one either. Pretty sure it's my least favourite of the series. This is still my least favorite film of the series. I don't mind some of Chris Columbus' by-the-book approach to directing if it can get the job done. The problem with this film is that since the story is very dark. He doesn't get his hands dirty towards the material as it calls for a bit more chaos and violence. 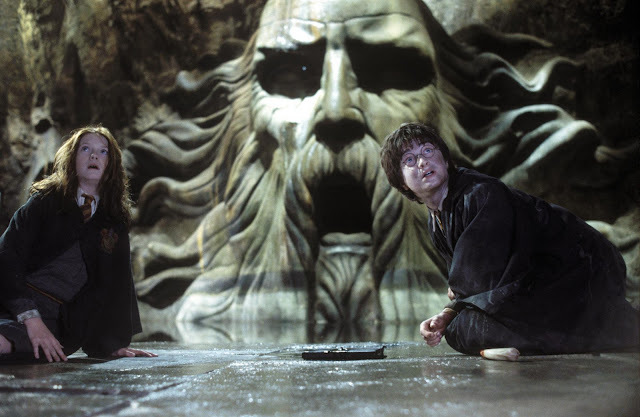 Plus, some of the scenes Columbus does such as Harry's discovery about Hagrid's involvement with the Chamber of Secrets was poorly executed. The story is handled very simplistically. I'm not sure what its like in the book - I'm not a reader of the novels, just a watcher of the films - but the amount of times Hagrid turns round and says 'I shouldn't have said that' is unreal. 1. The flying car sequence - one of the most fun action sequences of the whole series. Humorous and genuinely tense at the same time. 2. Kenneth Branagh hamming it up brilliantly as Gilderoy Lockhart. One of the best big name cameos of the whole series, bettered only by Imelda Staunton's skin-crawlingly creepy turn as Dolores Umbridge. 3. Richard Harris' final performance as Dumbledore. His turn as the headmaster in this film builds brilliantly on his work in the first film; to my mind his work in the first two films potentially betters anything Gambon does in most of the remaining six. Potter is one of those odd series where everyone seems to have a different favourite - there's no real consistency of opinion in what the 'best' one is. All good points too, although the flying car didn't do it for me personally but yeah, Branagh is awesome and Harris is excellent as Dumbledore. I'd echo the sentiments by saying it's disappointing especially coming of the heels of the Philosopher's Stone. Rather than blame the director Chris Columbus (to be fair he had a mammoth task in doing these films back to back), its the story I have problems with. It has no real purpose or knowledge of how it would tie in to later instalments. It really needed to push on and introduce more elements of the world a bit like Azkaban did with the Dementors and Sirius Black. Yes, I don't disagree with this either; it feels very much like a holdover... its waiting (earning a lot of money) whilst the more dramatic films come along. Then again, if they had have bothered to develop Ginny more, I would have been interested in the finale. As it was, she may as well be any anonymous character who's holding out for a hero.